Sorry for the delay, it’s time for Crossroads comics! Sometimes you can find friends in the weirdest places. You never know who you’ll relate to or who you will become good friends with. 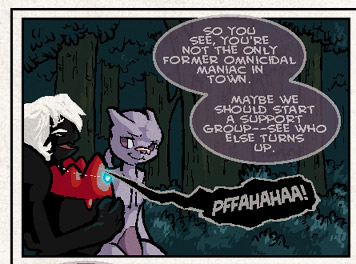 PMD: Victory Fire is one of those comics that does a great job or portraying it. A heartwarming story that relates all sorts of odds and ends from the Pokémon franchise together, it is a great read and I strongly encourage it. The story is winding down to its end slowly, and it has been a great ride throughout the years, but the story isn’t quite over yet. We’ve still got one more hurdle to cross before we finally reach the end. So if you to see the ending to this unique take on Pokémon Mystery Dungeon with all sorts of funny moments, great art, and worthwhile easter eggs, I highly recommend it. Pokémon Alpha It appears the gym leader is enjoying this a bit more than our hero is. PMD: Bridge of Invention Were those all guild members? Or someone else? PMD: Explorers of Life Bit of a tall request don’t you think? PMD: Past, Present, Future It appears we’ve got the Guildmasters of the Round Table present. Pokemon: Rising Shadows The fight begins! But Naya is nowhere to be seen! What will be the outcome of this epic clash? A Pokémon Yellow Nuzlocke So we’ve got our Pikachu let’s get going! Fans’ Blazing Red Nuzlocke Uh-oh, is this going to be freedom or death? Folded: A Heartgold Nuzlocke Because who cares about Giovanni when we can get some more Slowbro screen time? Golden Sun: A Sun Version Blindlocke Comic And they all died, the end. Nuzlocke on Ice Bit short notice don’t you think? Of Life and Death It’s a Chespin! Pokémon Emerald Double Nuzlocke Challenge It’s easy to lose track of time when you’re having fun. Pokémon Yellow Nostalgialocke Diglett’s Cave, the safe place to grind. Silver Linings: A Black 2 Nuzlocke The Doomchat? Is that Cheren’s? The Sea Glass Does no one notice the fleeing Charmander? Milos from Home We can always count on Milos for a happy go lucky attitude! On Borrowed Time PMD EOS Poor Malachi! You guys freaked him out! Pokémon Super Mystery Dungeon Comic The most mature of adult to child talks. Pokémon Mystery Dungeon The excitement is building! PMD: Adventures of Might & Magic He gasp! PMD: Adventures of Team Sunflower You’re overwhelming Hiro a bit, I think. [PMD] Choosing Our Fate Telepathy earpieces? Interesting. PMD- RAD Time to fight back! PMD: Tales of Elysium Hooray! Leon’s… not dead? PMD Team Aquablaze Hm seems like we’ve got an even larger search area now. PMD: Umbry the Thief Now there’s a familiar story for many of us. PMD: Victory Fire Friendship is a beautiful thing. PMD2: Team Awai He brings up a valid point. Pebble Version Well you know what they say. A laugh a day keeps the therapist away. Pokémon Unreal More friends seems like a good idea on the road to recovery. The Taken Will Rhyhorn be able to recover and win the fight? DancerQuartz Come on, Nintendo! Just give us what we want! Dorkly-Pokémon Sun Playthrough I don’t know man, that looked pretty cool to me. Gabasonian- Can’t Swim I don’t really think you should be complaining, Mr. Swimmer. Gabasonian- Wild Pokémon Trainers Don’t ever think about the little guys much do you? Trainer Wants to Fight Existential crisis! Bloom, a Pokemon Conquest Comic Is there any way this can be more honorable, righteous, and loving? Eevee Academy Ahh grade school. When it was easy to scare your friends into thinking a murderer was coming after them. Elementum Felidae And so it begins. 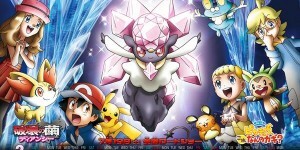 Pokémon: Interstellar Absolution The cover has been set so let the journey begin! Pokémon: Under the Surface Sometimes those emotional connections run too deep. Red Gyarados There seems to be a lack of interest in his father’s occupation there. Stupid Short Eevee Comic It’s for the best. The Stars Shine Bright The arrival of Topaz and Atticus! Trouble in Midst So we get a name for our hero? Gloomverse The happy reunion we’ve all been waiting for! Joseph and Yusra Fighting demons with a guitar is the best way to convey your message. Myth: Inflammation Uh-oh, it appears this may be a nightmare.